Produced water is an inextricable part of the hydrocarbon recovery processes, yet it is by far the largest volume waste stream associated with hydrocarbon recovery. Water production estimates are in the order of 250 million B/D in 2007, for a water-to-oil ratio around 3:1, and are expected to increase to more than 300 million B/D between 2010 and 2012 (Fig. 1, Dal Ferro and Smith 2007). Increasingly stringent environmental regulations require extensive treatment of produced water from oil and gas productions before discharge; hence the treatment and disposal of such volumes costs the industry annually more than USD 40 billion. Consequently, for oil and gas production wells located in water-scarce regions, limited freshwater resources in conjunction with the high treatment cost for produced water discharge makes beneficial reuse of produced water an attractive opportunity. Fig. 1 - Global onshore and offshore water production (Dal Ferro and Smith 2007). Water consumption worldwide is roughly split, with 70% agricultural use, 22% industrial use, and 8% domestic use (UNESCO 2003). A fifth of the population lives in areas of water scarcity, and one in eight lacks access to clean water. Currently, properly treated produced water can be recycled and used for waterflooding [produced water re-injection (PWRI)] and other applications, such as crop irrigation, wildlife and livestock consumption, aquaculture and hydroponic vegetable culture, industrial processes, dust control, vehicle and equipment washing, power generation, and fire control (Veil et al. 2004). These beneficial reuses directly decrease the withdrawal of potable water, a highly valuable commodity in many regions of the world. Although produced water can potentially be treated to drinking water quality (Tao et al. 1993; Doran et al. 1997; Kharaka et al. 1998; Funston et al. 2002; Xu et al. 2008), little research has been done on the feasibility and cost-effectiveness of direct or indirect potable reuse of produced water from oil and gas production. Produced Water and Treatment Alternatives Produced Water and Typical Treatment. The amount of produced water, and the contaminants and their concentrations present in produced water usually vary significantly over the lifetime of a field. Early on, the water generation rate can be a very small fraction of the oil production rate, but it can increase with time to tens of times the rate of oil produced. In terms of composition, the changes are complex and site-specific because they are a function of the geological formation, the oil and water (both in-situ and injected) chemistry, rock/fluid interactions, the type of production, and required additives for oil-production-related activities. Fig. 2 shows the typical treatment that produced water receives in oil and gas field operations. Treatment has three main stages. In pre-treatment, the bulk of the oil and gas, as well as coarse particles are removed. This is followed by the main treatment, which focuses on further removal of small hydrocarbon droplets and small particles from the water. This is achieved in two steps of treatment. The primary step removes larger hydrocarbon droplets and large solid particles, as well as hydrocarbon slugs. A secondary step goes after smaller droplets and particles, and it encompasses the bulk of the de-oiling equipment used in the upstream industry. This secondary step is usually sufficient to reduce the dispersed hydrocarbon content to below the typical offshore discharge level of 40 mg/L. Then, there is a final polishing treatment, which can be optional, where the oil concentration is lowered to levels typically below 10 mg/L. The implementation of this last treatment depends on either the regulatory framework or an operational requirement if water is going to be re-injected for either disposal or as part of the waterflood operations in the field. Sometimes an additional treatment is required, where the final effluent stream must have a high quality. In this case, oil concentration is typically below 5 mg/L, and there are usually other restrictions that must be met such as heavy metals content, biochemical oxygen demand (BOD) levels, and so on. Fig. 2 - Typical water treatment process in the oil and gas industry (modified from Shell 2009). Considering the main contaminants present in produced water, treatment goals include deoiling, desalination, degassing, suspended solids removal, organic compounds removal, heavy metal and radionuclides removal, and disinfection. These treatment goals are essentially the same for potable, nonpotable reuse, or disposal, although the level of contaminant removal required for potable reuse can be significantly higher, depending on the quality of the produced water. Removal of dissolved organic compounds: (1) adsorption [by activated carbon, organoclay, methylmethacrylate (MMA) - divinyl benzene (DVB) copolymer, functionalized zeolite, functionalized polymer fibers and resins]; (2) dissolved air predipitation; (3) chemical (e.g., ozonation, fenton process), electrochemical or photocatalytic (e.g., TiO2) oxidation; (4) biological degredation; and (5) nanofiltration or reverse osmosis. 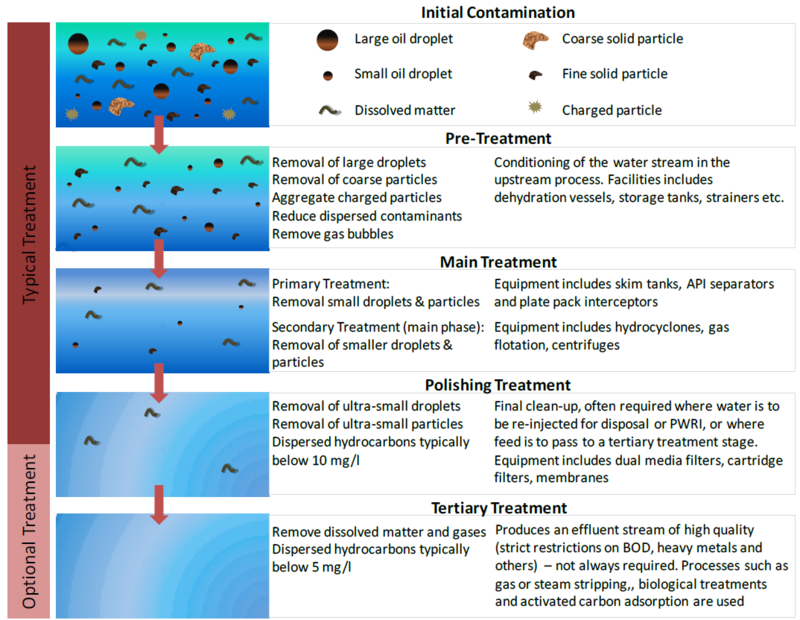 Removal of metals: (1) aeration + settling + sand filtration; (2) ion exchange; (3) reverse osmosis. Suspended solids removal: (1) coagulation/flocculation + sedimentation + filtration; (2) microfiltration or ultrafiltration. Research on treatment strategies for reclamation of domestic and industrial wastewater for reuse requiring high water quality has centered around reverse osmosis (RO) (Singh, 2008). RO can remove TDS and a wide range of dissolved organic compounds at very high efficiency. A number of laboratory and pilot-scale studies have demonstrated that drinking water standards can be met after RO treatment in combination with a number of pretreatment processes, including membrane filtration pretreatment using microfiltration or ultrafiltraiton membranes. (Tao et al. 1993; Ahmadun et al. 2009; Xu et al. 2008). The main problem with the RO treatment is the high TDS and oil contents of produced water, which result in very high osmotic pressure and fouling of the RO membranes by hydrocarbon compounds. The pretreatment processes remove oil droplets, suspended solids (e.g., coagulation and flocculation, sand or membrane filtration), metals (e.g., chemical precipitation), and dissolved organic compounds (e.g., adsorption, chemical oxidation, and biological degradation), and protect the RO membranes from excessive fouling at the same time. Many oil fields already have extensive treatment facilities for discharge requirement. These existing treatment processes can be used as the pretreatment for RO. At locations where land is more available, biological treatment could be a low-cost option for RO pretreatment. Pretreatment or posttreatment processes are also needed to remove dissolved gas and uncharged, low-molecularweight compounds, which are not removed by RO membranes. Because the idea of using produced water as an alternative drinking water supply is still in its infancy and the quality of produced water varies greatly from location to location, little is known about the feasibility of potable reuse and the level of treatment needed. However, much can be learned from the reuse of other alternative water sources such as domestic wastewater, the reuse of which has grown rapidly in the past two decades. Although not usually considered a way of reuse, indirect potable reuse is realized when the treated produced water is discharged into a water body used as a drinking water source. Planned indirect potable reuse may be achieved by surface infiltration (also known as aquifer soil treatment) or vadose zone injection of highly treated produced water into drinking water aquifers with a relatively long hydraulic residence time. This approach has been used for indirect potable reuse of domestic wastewater. Percolation of the treated produced water through the surface and vadose zone soil can further remove residual contaminants by filtration, adsorption, and chemical and biological degradation. When RO is used to treat the produced water, post treatment is usually needed to ensure that the solution chemistry of the reuse water is compatible with the aquifer. For example, RO-treated recharge water typically has very low TDS and low calcium to sodium ratio, which can potentially lead to dispersion of clays and consequently clogging of the aquifer as well as leaching of heavy metal species from the soil or the aquifer formation. This can be mitigated by strategies such as lime addition or blending with a local surface water source. Long-term impact of treated produced water on drinking water aquifer needs to be carefully studied. Direct potable reuse can be a possible option for inland production fields located in arid areas where other freshwater sources are limited, especially if the produced water is of relatively high quality. As discussed below, unknown toxic effects and public acceptance are important barriers. These are critical issues for potable reuse of all wastewaters and are not unique to produced water. Much can be learned from reuse applications of other wastewaters. The rapid growth of the world population poses a great challenge to our drinking water supply. Agriculture and energy production draws more and more freshwater, while producing more contamination of the already scarce freshwater resource. Effluent streams that once were treated as “waste” are now considered a valuable “resource.” The large quantity of 5 produced water generated from oil and gas production worldwide can be potential freshwater sources for various applications, including potable consumption. Potable reuse of produced water faces similar challenges to other types of wastewater. These challenges include high treatment cost, potential chronic toxicity of the treated produced water, and public acceptance. Additionally, the amount and properties of the produced water change over time, making a “one size fits all” solution unlikely. With respect to oil and gas produced water, the treatment cost strongly depends on the physical and chemical characteristics of the produced water, which can vary widely among production fields and change over time within a given field, and the regulatory environment. For example, produced water from gas production, especially coalbed methane production, typically has lower TDS, oil, and grease content than that from oil production, treatment of which could potentially be competitive with other wastewater sources. Therefore, technology solutions for potable reuse of produced water would need to be customized accordingly to the properties of the produced water and the amount of water to be treated. Because of the need for desalination and removal of a large number of organic compounds, RO will most likely be used for potable reuse applications. Although RO is capable of removing many organic compounds at high efficiency, the combined chronic toxicity of the organic compounds existing in mixture in the RO permeate needs to be carefully evaluated before direct reuse is implemented. It has been shown that the toxicity of dissolved organic compounds in produced water can be additive (Glickman 1998). The current drinking water standards were established based on the human health risk associated with individual contaminants. A method for establishing maximum safe contaminant concentrations based on combined impact of the contaminant mixture is needed. In addition, potential formation of disinfection byproducts (DBPs) needs to be evaluated. Existing studies on DBP formation were mostly performed using surface water, groundwater, or reclaimed domestic wastewater. The DBP formation potential of treated produced water has not been investigated. Although the total organic carbon concentration of RO-treated produced water is low, the presence of iodide and bromide can potentially form DBPs that are much more toxic than chlorinated DBPs (Woo et al. 2002). Finally, the greatest barrier, as in domestic wastewater reuse, is probably public acceptance. Although existing technologies have been demonstrated to meet current drinking water standards (Ahmadun et al. 2009; Xu et al. 2008), there are concerns on unknown toxic effects or unknown toxic compounds. Until the human health impact of chemical mixtures are better understand, toxicity assays are necessary to address concerns on the potential synergy between toxic compounds and the possibility of undetected toxic compounds in the treated produced water. Bailey, B., Crabtree, M., Tyrie, J., Elphick, J., Kuchuk, F., Romano, C. and Roodhart, L. 2000. Water Control. Oilfield Review Spring 2000: 30-51. Dal Ferro, B. and Smith, M. 2007. 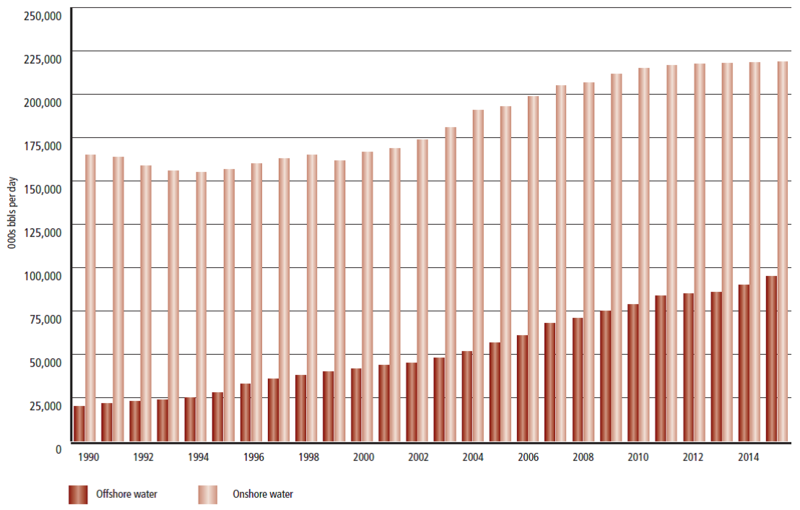 Global onshore and offshore water production. Oil & Gas Review OTC Edition. Doran, G.F., Carini, F.H., Fruth, D.A., Drago, J.A. and Leong, L.Y.C. 1997. Evaluation of Technologies to Treat Oil Field Produced Water to Drinking Water or Reuse Quality. Paper SPE 38830 presented at the SPE Annual Technical Conference and Exhibition, San Antonio, Texas, 5-8 October. http://dx.doi.org/10.2118/38830-MS.
Funston, R., Rajagopalan, G. and Leong, L.Y.C. 2002. Proc. 2002 GWPC Produced Water Conference, Colorado Springs, Colorado. Glickman, A.H. 1998. Produced Water Toxicity: Steps You Can Take to Ensure Permit Compliance. Paper presented at the API Produced Water Management Technical Forum and Exhibition, Lafayette, Louisiana, Nov. 17-­‐18. Kharaka, Y.K., Leong, L.Y.C., Doran G. and Breit, G.N. 1998. Proc. 5th International Petroleum Environmental Conference, Albuquerque, New Mexico. Shell International E&P. 2009. Integrated Water Flood Training. Singh, R. 2009. Production of high-purity water by membrane processes. Desalination and Water Treatment. 3 (1-3): 99-110. Tao, F.T., Curtice, S., Hobbs, R.D., Slides, J.L., Wieser, J.D., Dyke, C.A., Tuohey, D. and Pilger, P.F. 1993. Reverse osmosis process successfully converts oil field brine into freshwater. Oil Gas J. 91 (1993) 88–91. UNESCO. 2003. Water for People, Water for Life, United Nations World Water Development Report. Veil, J.A., Puder, M.G, Elcock, D., and Redweik, R.J. Jr. 2004. A White Paper Describing Produced Water from Production of Crude Oil, Natural Gas, and Coal Bed Methane. Prepared for the U.S. Department of Energy, Energy Technology Laboratory. Xu, P., Drewes, J.E. and Heil, D. 2008. Beneficial use of co-produced water through membrane treatment: technical-economic assessment. Desalination, 225 (1-3): 139- 155. Woo, Y.-T.; Lai, D.; McLain, J. L.; Manibusan, M. K.; Dellarco, V. 2002. Use of mechanism-based structure-activity relationships analysis in carcinogenic potential ranking for drinking water disinfection by-products. Environ. Health Perspect. 110 (suppl. 1), 75-87. You, S.J., Tseng, D.H., Deng, J.Y. 2008. Using combined membrane processes for textile dyeing wastewater reclamation. Desalination 234, 426-432.